Not only is our concert made up of very recently composed music, our audience will actually hear two premieres featuring the composers as performers. One of these premieres is a remarkable, refreshing quartet written by our own Laura Hood (b. 1961). Although she’s never had a single lesson in composition, Laura has always had a penchant for writing songs. 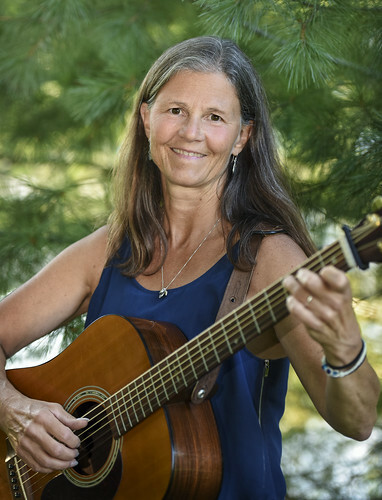 Though a horn player through-and-through, her favored composition medium has always been voice and guitar in the singer-songwriter and folk style rather than classical horn. When the lyrics won’t come to her, she simply makes the piece instrumental! At our summer potluck and mini concert back in 2015, Laura and her guitar regaled us with a solo performance of one of her beautiful songs (with lyrics!) romanticizing our four seasons in Northern Michigan. Having outed herself to the entire group as a composer, I hoped it would only be matter of time before she was brave enough to put some of her music on paper and slip it into the hands of her fellow Manitou Winds members! To my delight, she presented me with First Flight in January 2016 and gave me a guided tour of the score. 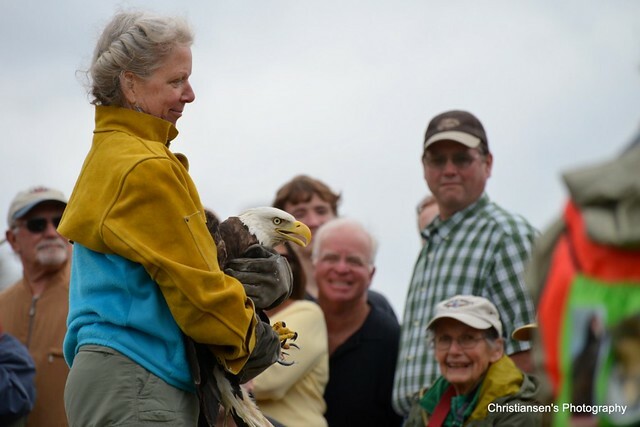 Laura composed First Flight to honor her friend Rebecca Lessard, founder of Wings of Wonder, a raptor rehabilitation center and sanctuary based in Empire, Michigan. 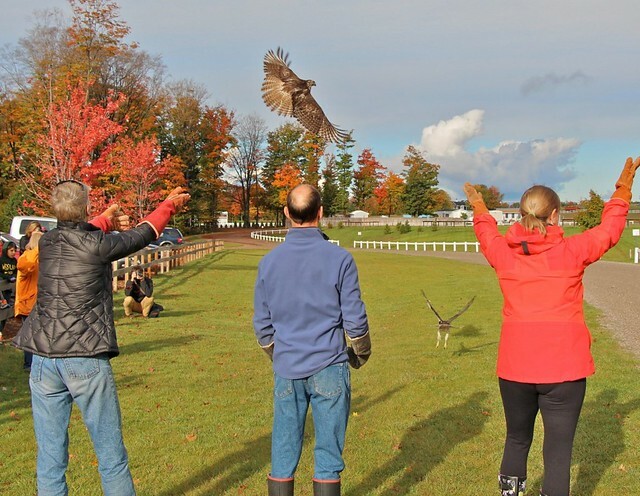 WOW has a tremendous impact in Northern Michigan — rescuing countless birds while continuing to house those who are unable to be returned to the wild. 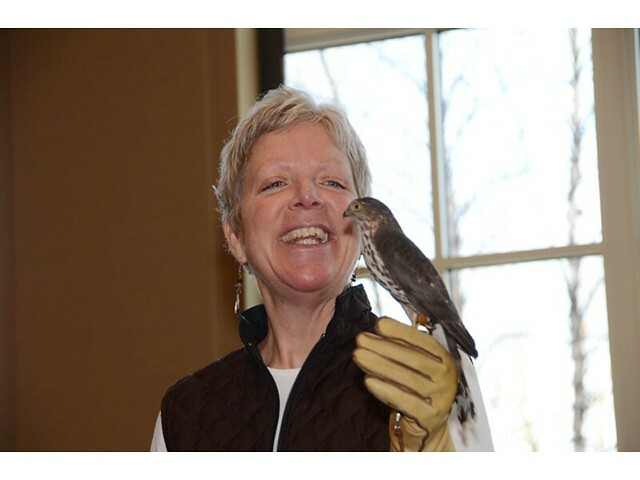 Beyond the life-saving force the organization provides with the help of its many volunteers, Rebecca’s efforts to spread the word about these majestic creatures through community outreach in schools and community events makes her a local hero. Right away, I loved the unmistakable folk vibe that emanated from Laura’s guitar scoring. By adding in flute, clarinet, and harp, Laura’s piece became something truly unique — a combination of timbres that is rare if not completely brand new. Without being prompted, the next thing I noticed in the music was that it seemed to be telling a story — there was a dialogue between the flute and clarinet, an interplay between all four parts which seemed to be painting a picture worth thousands of words. A picture not revealed by the one-word titles of the movements. Laura explains, “Many of the birds are clinging to a tiny thread of life when they first arrive at WOW. Movement one (Waltz) represents the tender care each new avian patient is given.” Rather than the typical steady, dance-like feel we would associate with a waltz, the music begins with a very thinly-scored but hopeful tune that grows and swells as the movement progresses (as the bird begins to heal and grow stronger). As I learned more about WOW, I uncovered the sad fact that not all of the birds survive their trauma and move on toward recovery. Some are tragically beyond repair and are humanely euthanized. Perhaps more touching, though, are the birds who do recover but are permanently disabled, living the remainder of their lives sheltered in the loving sanctuary WOW provides. 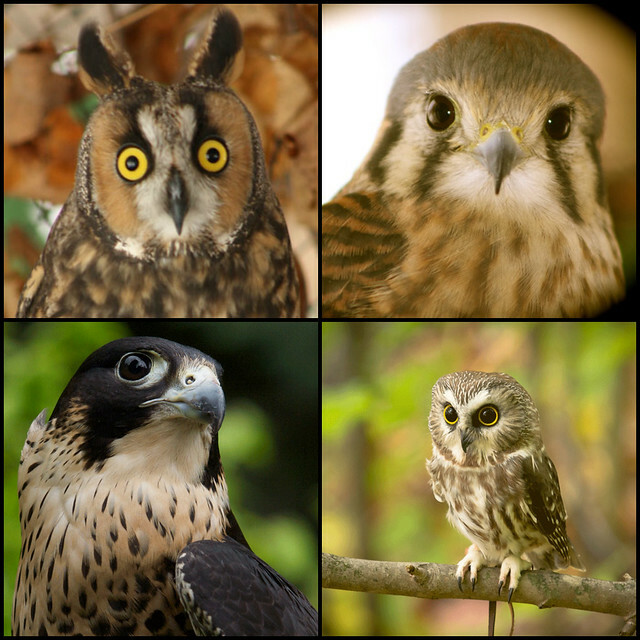 Many of these birds are often taken on roadtrips for outreach programs Rebecca provides in the area. Not only was this composition a departure for Laura because it required her to completely score and notate her music in a fixed form, but she had never before written for winds or harp! It became a learning and teaching experience for the whole quartet as we discussed the particulars of articulation and phrasing. We’re excited that Laura plans to write more pieces for this unique quartet. 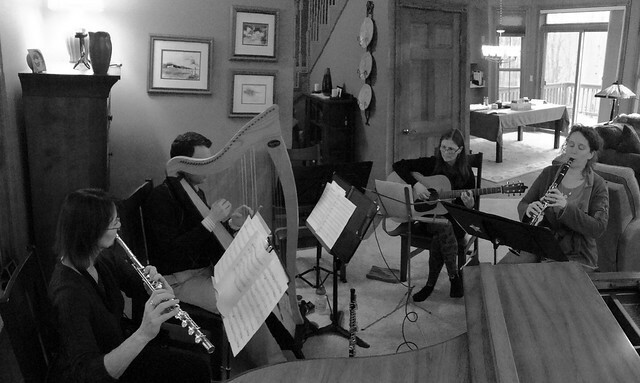 Rehearsing this one-of-a-kind work has been a treat for all of us — a chance to break away from the more traditional sounds of a classical chamber ensemble, allowing ourselves to immerse in a completely different acoustic. We are grateful that Laura has bestowed upon Mantiou Winds this unique treasure of chamber music telling the miraculous story of broken wings mended by loving and caring hands. We hope you’ll join us as Laura’s piece receives its premiere. I love this group. How do I get a copy of the album? Congrats from your uncle Steve. Non of us Warnaar’s needed formal training to produce worthwhile musical/artistic productions. We are passionate about art and music and just need an opportunity and encouragement to make it happen. It’s a whole lot of fun to do it without formal training. Trials and errors lead to amazing moments of discovery. Way to go Laura!! Hope to hear it sometime. Hi Steve, I’ve forwarded your message to Laura. Thanks for the encouragement! We hope to have more pieces from her in the future.